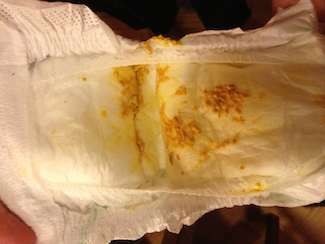 After birth, Infants will have dark, tarry, sticky stools called meconium for 3 to 5 days. As feeding is established, the stools will gradually lighten. Normal infant stools are the color and consistency of guacamole or seedy dijon mustard. In the first two weeks of life, I view stools as a sign the child is well hydrated and getting milk. If the mother of a breast fed newborn calls and reports her child has not stooled in 24 to 48 hours, my immediate concern is that the child is not getting adequate nutrition. On the other hand if a well grown and non-fussy 3 week old has not stooled in 2 to 3 days, I would typically observe them for an additional 48 more hours before taking action.